The Oirase Gorge in Aomori Prefecture in northern Japan can claim to be one of the most beautiful river valleys in Japan if not the most beautiful. Oirase Gorge runs 14km between Yakeyama at the foot of Hakkoda-san and Nenokuchi on the shore of Towada-ko (Lake Towada). 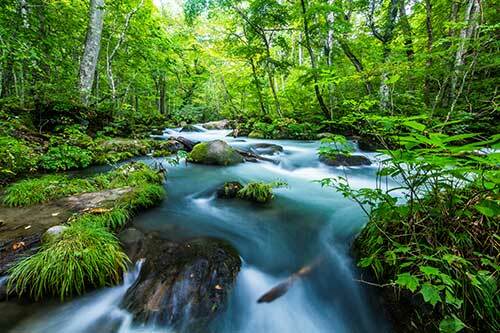 The Oirase Stream drains from Lake Towada down a gentle gradient of 200m to Yakeyama. At the center of the gorge is the charming Ishigedo rest area. 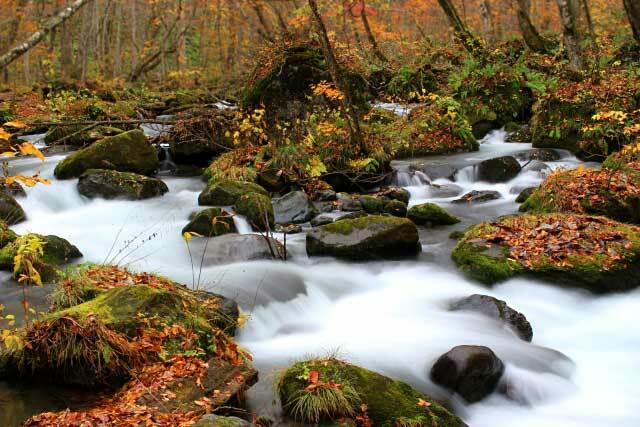 The crystal-clear Oirase River flows mostly parallel to the road through a beautiful deciduous forest, known for its spectacular colors in autumn with fantastic shades of yellow and red leaves. The gorge is marked by a number of interesting rock formations which are marked by signposts. These include Fudo Rock, Byobu Rock, Makado Rock and Tengu Rock. A number of icy rapids and plunging waterfalls add to the beauty of the place. The many waterfalls and rapids have been given colorful names such as: Soryu Waterfall (Two Dragon Waterfall), Tomoshiraga Waterfall (Happy Marriage Waterfall), Kudan Waterfall (Nine Stairs Waterfall), Shiraito Waterfall (White String Waterfall), Shirakinu Waterfall (White Silk Waterfall), Tamadare Waterfall (Bead Curtain Waterfall) and Shimai Waterfall (Sister Waterfall). Oirase Gorge is a favorite with cyclists and hikers and is a must-see if you are in Aomori Prefecture for any length of time. A well-marked hiking course runs mostly off the road along the banks of the river and hikers can synchronize their walk with buses running to and from Aomori.